After serving in Iraq from 2001 to 2005, Marine veteran Bryan Babcock returned stateside with the intention of studying to become a police of­ficer. A commercial on TV inspired him to contact ITT Technical Institute, a for-pro­fit school, about its bachelor’s degree criminal justice program. His subsequent enrollment at ITT Tech resulted in three years of wasted effort and more than $50,000 of debt — all in pursuit of an unaccredited degree that no employer would recognize. What Babcock did not realize was that not all bachelor’s degrees are created equal. A bachelor’s degree that is not recognized by employers has little value, even if it is technically accredited, as Babcock found, to his and his family’s detriment. “I argued that, in order for them to have a school, they had to be accredited by the government. I didn’t realize that there was a difference in the accreditation bodies,” he explains. When Babcock and his wife discovered that ITT Tech course credits are not recognized by the police departments where he sought employment, he was already three years into the program—and tens of thousands of dollars in debt. ITT Tech is one of several for-profit schools across the country that offer dubious degrees for exorbitant prices. Such schools rely on aggressive and arguably predatory practices to “sell” the school to prospective students. Students who are unaware of the differences in accrediting agencies may believe the for-pro­fit school is a good investment, only to discover later that their degree is of little or no use with regards to their employment opportunities postgraduation. 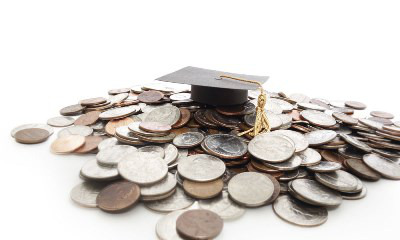 For-profits are restricted by a 90/10 rule, which requires that for-pro­fit schools derive no more than 90 percent of their revenue from federal financial aid. Because the Post-9/11 GI Bill funds do not “count” as federal ­financial aid, for every veteran dollar, schools can avail themselves of $9 of federal financial aid. For that reason, veterans are particularly attractive customers to for-profits, especially after the Post-9/11 GI Bill was passed. The new bill offers generous financial assistance to veterans and their families. Though the fraudulent practices of some for-profit schools have been well documented, students continue to enroll there. “Some of the for-profit schools sound like they’re not legitimate schools. But some of them are harder to tell,” says Robert F. Muth, an adjunct professor of law at the University of San Diego (USD). “You may go onto their website and see that they claim they’ve been around since the 1800s. But, in reality, they just bought a real school that’s been around since then,” says Muth, who is also supervising attorney for the Veterans Legal Clinic at USD. “If you’re a veteran, you might know that Harvard and Yale are better than some other schools. But that large middle ground, they’re just not going to know the difference,” he says, adding that for-pro­fits tend to recruit among enlisted personnel roughly between 24 and 30 years of age. Compared to community colleges, for-profits have more funds to spend on advertising and marketing. With those extra funds, for-profits are able to invest in visiting bases to recruit among active military. “The for-profits are very savvy in how they market. Getting on base allows them to operate under the appearance of being approved by the military,” says Matthew Boulay, executive director of the Student Veterans’ Loan Relief Fund. In recent years, there has been a dramatic spike in the number of veterans attending—and GI Bill funding going to—for-profit schools. A Senate report from the Health, Education, Labor and Pensions (HELP) Committee titled “Is the New G.I. Bill Working?” shows that $1.7 billion of post-9/11 benefits went to for-pro­fit schools during the 2012-13 academic year. The same report showed that eight of the top 10 recipients of Post-9/11 GI Bill benefits were for-profit schools during the 2012-13 academic year. At the top of the list, the Apollo Group raked in $272 million, followed by Education Management Corporation (EDMC) with $163 million. ITT Technical Institute came in third with $161 million of GI Bill benefits. Apollo Group oversees the University of Phoenix, which has received nearly $1 billion nationally in Post-9/11 GI Bill funding over the past ­ five years, according to an investigation by The Center for Investigative Reporting (CIR). For-profits tend to be much more expensive than their public counterparts. For example, tuition to complete a bachelor’s degree business program costs $70,439 at Westwood College, compared to $41,056 for the University of Colorado’s program. Westwood is a for-profit owned by Alta College Inc. Yet the recent fall of Corinthian Colleges Inc. suggests that at least some of the for-profits may be on shaky ­financial ground. Corinthian is a for-pro­fit company that operates three chains of campuses in Canada and the United States: Heald College, WyoTech, and Everest College and University. The company took in the seventh largest haul of Post-9/11 GI Bill benefits between 2012 and 2013. This summer, the federal government withheld federal financial aid from Corinthian for a period of 21 business days. Corinthian’s finances went haywire. As part of an agreement with the Department of Education, Corinthian agreed to shut down 12 of its campuses and sell 85 more. As of last March, Corinthian served 74,000 students on its 107 campuses. “They’re really an instructive case study, because you see with the Department of Education holding back some of their funds how quickly the whole house of cards came down,” Muth says. Even as Corinthian began the process of shutting down and selling its campuses, the company continued to actively recruit and market to prospective students, including veterans and military. “They’re recruiting for programs that essentially we knew were of very little value and also, more importantly, potentially are not going to exist in the next year or so,” says William Hubbard, vice president of government affairs at the Student Veterans of America (SVA). A total of 8,854 veterans were enrolled in the Corinthian system, according to 2012 VA Comparison Tool data. SVA reached out to Corinthian in the wake of its ­financial upset. “It did take them about a month to respond to our call, which we were not quite pleased about,” Hubbard says. “But eventually when we did meet with them, they shared that they were planning to sell most of their campuses to other schools and that essentially their students would be OK.
As a result of the conversation with Corinthian, the SVA published a “not recommended” list of colleges on July 21. The list is limited to Corinthian’s three chains: Everest, Heald and WyoTech. “Our main concern was the fact, simply, that they had an uncertain future, and could not with any kind of clear answer know what was going to happen to the students or to the schools,” Hubbard says, adding that SVA is not a regulatory or investigative body. “There have been individuals who have requested that we add other schools for various reasons, whether it be recruiting practices or the quality of education, but ultimately that’s not necessarily our role, so we haven’t taken the next steps to add other colleges at this point,” Hubbard explains. Students who find that their degree from a for-profit has no value may discover that they have limited options for recourse, as Babcock’s experience illustrates. In 2008, Babcock joined the National Guard, in part tempted by its loan relief program. He was deployed to Iraq within months. While he was overseas, his wife received notice of a $4,500 “transfer fee” addition to their loans from ITT Tech because the family had moved from Anaheim, Calif., to Bellevue, Wash.
To escape the crushing burden of debt, the family turned to the Veterans Legal Clinic at USD, only to ­find out that the statute of limitations for fraud in the state of California had already passed. With effort, and a $5,000 grant from the Veterans’ Student Loan Relief Fund, the family has managed to knock their debt down to $47,000, but they have many years ahead of them before it will be paid back. Babcock’s dream of becoming a law enforcement of­ficer has been deferred. For now, he works at Target. — Catherine Morris can be reached at cmorris@diverseeducation.com.